When we broke 2119 to the downside back in early-October, my first instinct was that SPX was forming an expanded flat, and that we'd see a rally, in wave 2/B, to 2180 SPX. 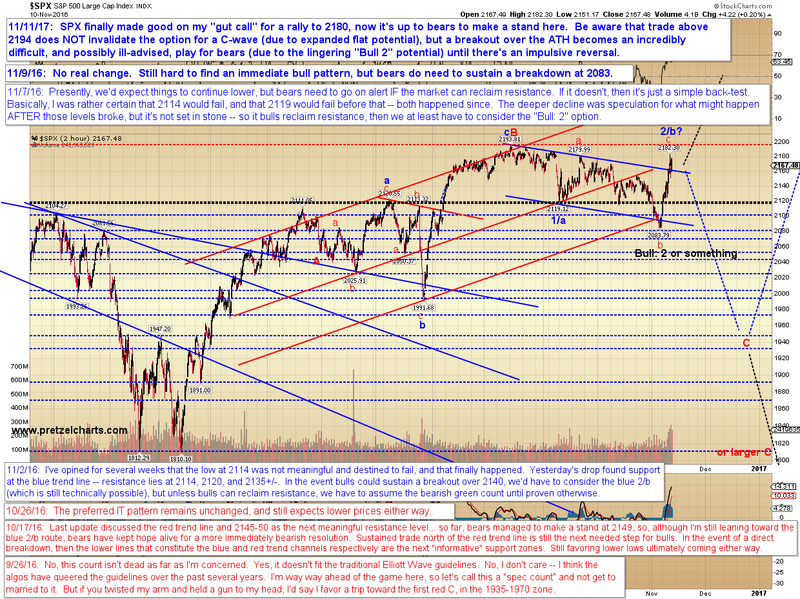 Then we had another breakdown, and I wrote that the 2/B rally was still alive, but that we had to "assume the most bearish count until proven otherwise" -- because what else can you do at that point? There are times the market sets itself up into a pattern with great potential energy, and that energy always has to be respected -- in much the same way that you wouldn't run around blindly in an open field during a violent electrical storm. Maybe you won't get hit by lightning, but you have to deeply respect that you very well could be. But just as with an electrical storm, sometimes that energy never connects, and thus never gets farther than the "potential" stage. Unfortunately, there's just not much you can do about it other than protect yourself along the way via stops. Yesterday, we finally reached 2180+, which was the target for the 2/B count, and SPX reacted to that zone with a decent rejection. 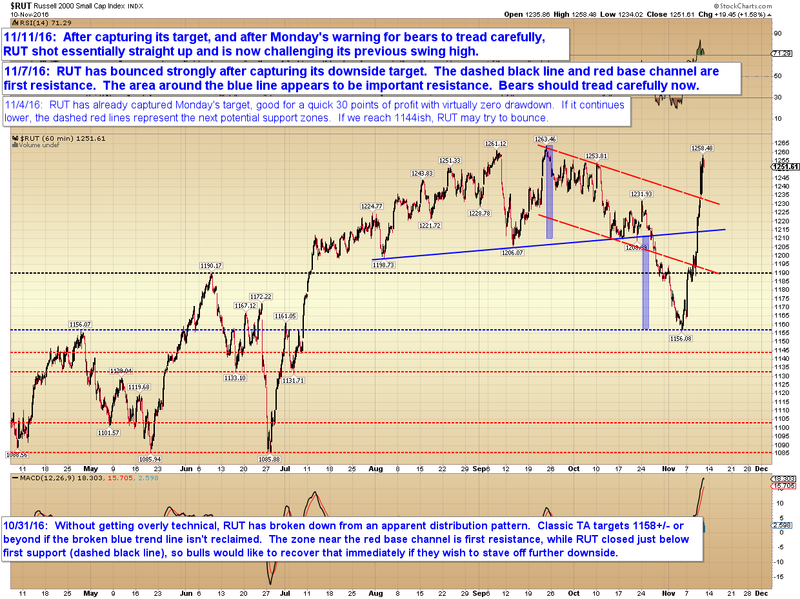 Now it's up to bears to keep pushing. In the event SPX sustains a breakout over the all-time-high, then we're back into a situation where we'd need to respect the potential energy of the pattern, but this time to the upside. From a technical standpoint, do be aware that a break of the ATH does NOT technically invalidate the bearish C-wave. It just makes it really hard to trade, and possibly ill-advised (running around an open field during a lightning storm again...) until there's an impulsive downside reversal. 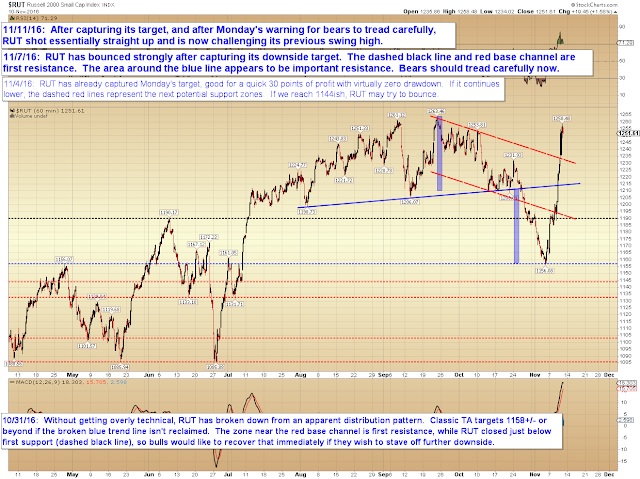 Thus, bears would like to see the ATH hold, because that makes the trade manageable, and keeps the stop zone clear. Somewhere in here, I need to note that it's worth a reminder that the bond market is closed today due to Veteran's Day, so I'm putting that here. Or, uh, "there" (see prior sentence), as the case may be. Of note, INDU did breach its all-time-high. From an Elliott Wave perspective, that breach can still potentially be counted as a fifth wave, so it's not the end of the world for bears just yet... but they do need to make a stand pretty darn soon to hold out hope for an intermediate decline. It's the moment of truth for the 2B wave, and for bears in general... at least for the immediate future. Trade safe.